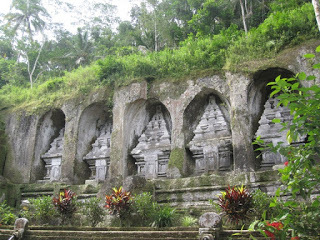 Gunung Kawi Ancient Bali Temple is a temple complex beside the river . 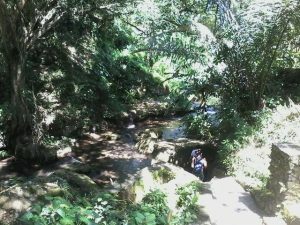 Located in Kawi village , Tampak siring district . 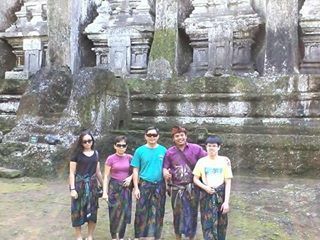 Gunung Kawi Ancient Bali Temple were build around 11 century . 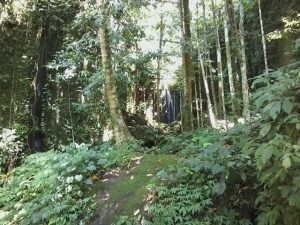 The location of the Temple is easy to reach which is lies ies approximately few hundreds meters from the main road of Tampak Siring district . Along the road toward the Holly Spring Temple . As soon as we turn from the main road there is big parking . Than we need to walk about 300 meters before the stairs . Where the street are full with local souvenirs shop and Warung . Best way to get here is to hire a car with your Bali Private Driver and Guide . The temple complex are located down by the side of the river . There are approximately 300 stairs to defeat to get into the site . Along the stairs we will see amazing view of the river and lush green rice terraces . And as soon as we arrive we will see the ancient shrines carved on the wall on the both side of the river . Approximately 500 meters tall with simple architecture . The story tells that all thus unique shrines is dedicated to King Udayana from warmadewa dynasty and his family . The king who rules over the island with his wife Ratu Gunapria Dharmapatni . The project of this temple starting during the rule of King Marakata and continue by his brother king Anak Wungsu . King Udayana is a king from Warnadewa dynasty . He and his wife rule the country wisely and give freedom to the peoples to express their believer in a different ways . During his era Hindu concept of Three Murti were set up . With the kingdom hight priest Mpu Kuturan , the king were set all most of Bali Hindu tradition , ways of life based on Hindu and a village / community system . This system well known as desa pakraman with its three kahyangan temple dedicated to Lord Three Murti . Beside that the priest also built few temples such as Kahyangan Jagat temples all around the island . And also based to local villager story that goes to the living era of Kebo Iwa . The strongest man who were born to be a strong general of Bali kingdom . He has a gift with architecture talent , pure heart and high spiritual power . During his era Bali Kingdom were independent king . According the peoples tales that spreading from generation to generation that he was created all the shrine on the wall in one night . With his spiritual power and architecture talent he carved all the sculpture on the solid rock wall using his finger nails . To enter the temple we will require to wear the Sarong the traditional Balinese dress that we can have for free at the ticket checking counter . 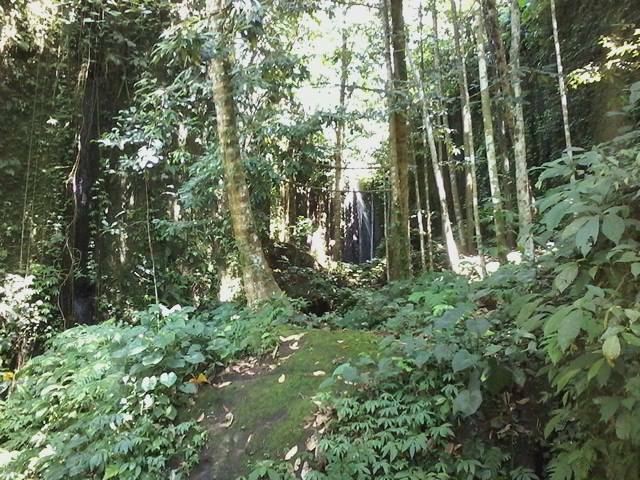 We also require to pay the small entrance fees around 20.000 rupiah . Wow!! Looks like a lot fun filled with interesting sightings. Awesome photos! Great pics and useful info too, esp. on dress code. Sometimes you reach a destination and realize that something specific is needed so advance info helps. Thank you for spending your precious time for reading our article . Had a wonderful feedback comment from you . Such beautiful temple. Bali is so wonderful! Wow this place looks amazing! Thank you for sharing! What a neat experience, so awesome!! These photos are amazing. I so want to visit Bali but it is so far away so I am currently traveling somewhere closer and cheaper i am afraid. Bali is on my list of placed to go. These pics are beautiful. Wow I really need to start traveling this looks amazing!